The Lodha people are moderately educated. Their status and identity varies from place to place. They claim Rajput ancestry, which means high status, but many others consider them to be a "backward" community. They seem to be rising in their status and their economic situation, though their progress is slow. 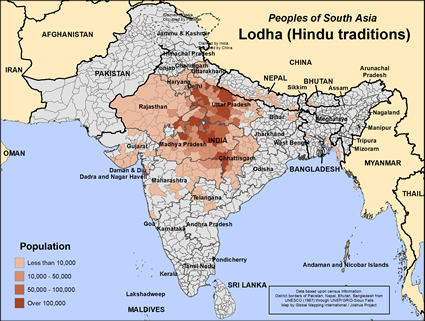 Most of the Lodha people live in India's northern and central states, but a few have migrated to Bhutan or Nepal. The Lodha people is generally agricultural. Besides cultivation, they rear cattle, work as agricultural laborers and make ropes. In today's world, some are starting their own businesses. In some areas, the girls are tattooed at an early age on the chin and forehand. Some of these Hindus claim their descent from Lav, the son of Lord Rama. As strict Hindus, the Lodha people observe all the major festivals. Though their identity may vary from state to state, the 44,000 Hindu Lodha people need to put their identity in Christ, the son of the one who formed mankind from the earth and gave him the commission to be fruitful and multiply. * Pray for the Holy Spirit to soften the Lodha people's hearts and to create a discontent with the spiritual desert they live in. *Pray for believers to adopt and evangelize the Lodha and to begin a vibrant church planting movement. * Pray that their communities will be so thoroughly transformed that other peoples in India, Nepal and Bhutan will take notice. https://en.wikipedia.org/wiki/Lodha_peopleView Lodha (Hindu traditions) in all countries.